New York Giants‘ general manager Dave Gettleman made it a priority to upgrade the offensive line the moment he was hired to lead the historic franchise to the promise land. Last season, he cleaned house on the line and began to piece together a more improved unit, allocating heavy investments including cap-space and draft picks. Signing players like Nate Solder and drafting Will Hernandez helped spark an improvement after a tough first-half of the year. They were luckily able to acquire former Ram, Jamon Brown, through waivers, despite letting him walk this free agency period after trading for star guard Kevin Zeitler. The Giants are expected to allocate a draft selection towards right tackle to replace Chad Wheeler if they choose not to sign a veteran like Mike Remmers. 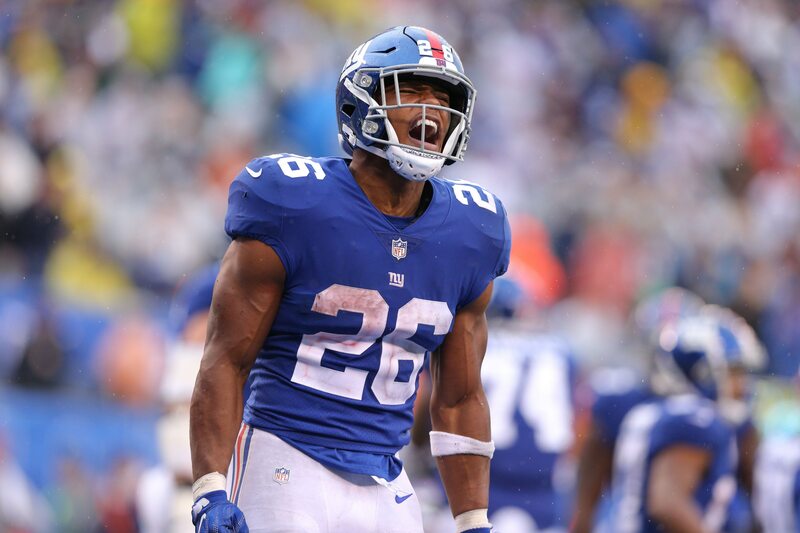 Building a solid line will not only help Eli Manning operate the offensive at a high level, but it will make Saquon Barkley that much better. Last season, Barkey, as a rookie, racked up over 2,000 all-purpose yards and 15 touchdowns to complete a dominant inaugural season that earned him the Rooke of the Year award. Now, this was all behind an offensive line that ranked 23rd in the league, according to NFL.com. Since then, they’ve established a foundation on the offense with Solder, Hernandez, Jon Halapio, Zeitler, and an expected upgrade at right tackle. The entire left side of the line has chemistry together and progressed well as the 2018 season went on. Considering the fact that the offensive line improved this offseason, it’s possible Barkley shatters even more records in the campaign ahead. We can expect another 2,000 all-purpose yards season, but also to eclipse his rookie total of 1,307 rushing yards and 721 passing yards. With Odell Beckham Jr. being traded to the Cleveland Browns, the Giants’ offense is Barkley’s to run, and you better believe they will be focusing on him heavily in 2019 and beyond. Building chemistry and a rapport with his new teammates will be essential moving forward, and he’s more than prepared to take on the challenge.